How to be unprofessional. Because we should always learn from the mistakes others make. Today I received some news that did not make me happy. If you know the band 100 Monkeys, chances are you also know two out of the five members of the band announced, not too long ago, that they were not going to perform with the band for time being due to other projects in their lives. Not too long ago we found out the two new members who would join the remaining three in their shows, in order to continue to perform the song their fans adored and even create new ones. I have not had a chance to meet the new members yet, so I can’t really comment on this subject. But the news I received today was a bit more complex. Today all fans following the band’s twitter account received a tweet to check some news on their website. 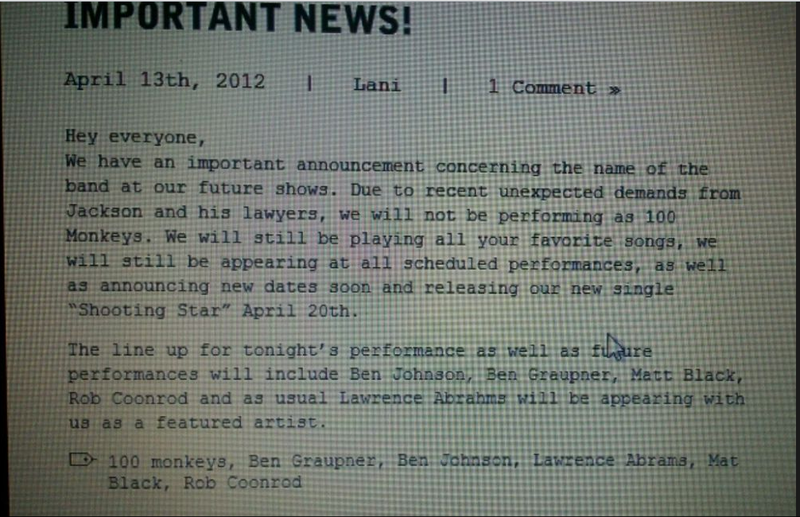 The news, written by the band’s manager, was saying that due to demands made by Jackson (Rathbone) and his lawyers, the band will no longer be named 100 Monkeys. They will, however, continue to play the songs the band used to play and which the fans grew so familiar with. I’m sorry, but this piece of information did piss me off. And why? Because I do believe their manager was unbelievably unprofessional when delivering the information in such way. The post should have only stated that, due to reasons beyond their control (or simply unfortunately) the band would no longer use the name 100 Monkeys. That’s it! Naming the one “to blame” for it is not something any respectable professional should ever do. That only came to reinforce my opinion of said manager. I never understood why they got her in the first place, and from talking to other people I know I was not the only one who disliked her. But still, I never expected her to disrespect any of the band member, whether or not he’s no longer a part of the band. A note to the band’s manager: dirty laundry should not be washed in public. No one needs to know the behind-the-scene problems. Keep it professional. And respect others. Always. A message to the musicians: Keep up with the good work. Your fans will keep supporting you. We truly appreciate your dedication and cannot thank you enough for all the good times. Thank you for all the shows, the laughter, the dancing, and the inspiration. We admire every single one of you for your talent and dedication. And we can’t wait to get more songs from you, guys. P.S. : Tried to go to their website to check the news again and put a direct link to it here in my blog, and the site is “temporarily unavailable.” I wonder if they are rectifying her indiscretion. Because some people need to learn to be more professional. Update #2: Lani tweeted yesterday that she was not the one responsible for the information, that it was written by the band and she just posted. However, the post contained information that should not be released to the fans in such a way, and the position of the manager is to identify the possible implications of words written on the internet. Something you put on the internet will always be there. People have copies of it, whether you take it down later or not.